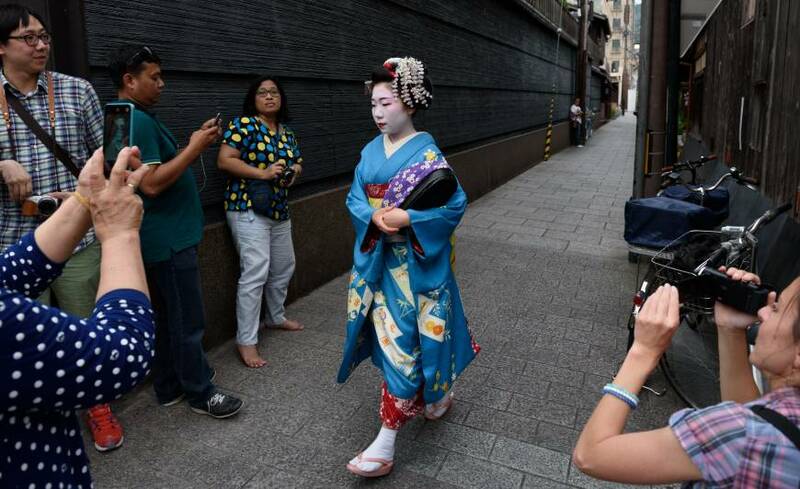 A record 19.73 million people visited Japan in 2015, marking the first time in 45 years that the number of incoming travelers surpassed the outbound figure, the tourism ministry said Tuesday. The announcement confirms once again that the nation is almost sure to achieve its target of attracting 20 million foreign visitors in a year by 2020. The success has sparked the government to think about revising the target upward. The 19.73 million visitors marked a 47.3 percent increase from 2014, when 13.41 million people entered Japan, and is nearly four times the 5.21 million who visited in 2003 when the “Visit Japan” campaign began. 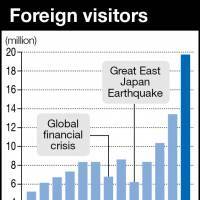 Spending by foreign visitors also reached a record ¥3.48 trillion, up 71.5 percent from 2014. This means the size of Japan’s inbound tourism industry now equals that of its auto parts exports, tourism officials said. 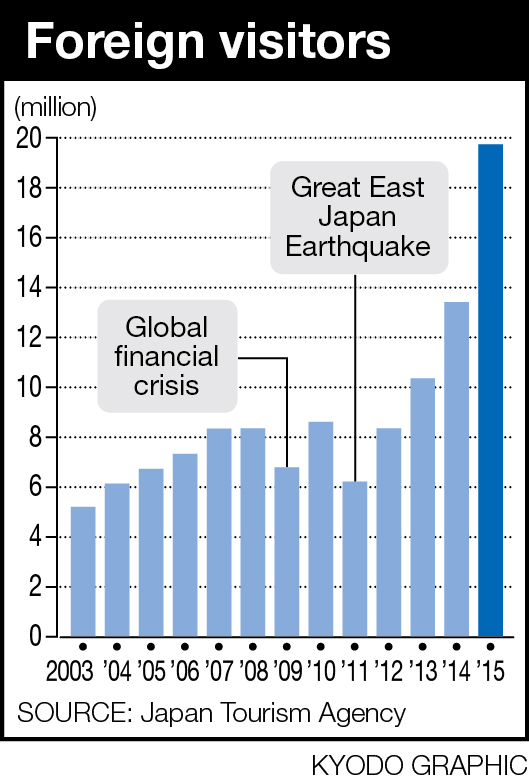 But officials are cautious on whether such rapid growth will continue this year, citing uncertainties in the Chinese economy and major destinations such as Tokyo and Osaka having nearly reached their capacities for accommodating the influx. According to the Japan National Tourism Organization, travelers from China topped the list for 2015, accounting for 4.99 million, more than twice as many from the year before. They were followed by 4 million from South Korea, 3.67 million from Taiwan and 1.52 million from Hong Kong. The growth record is attributed to a number of factors; the burgeoning middle-class in China is one, with its growing appetite for overseas travel. For such people, Japan, due to the depreciation of the yen, has become a bargain destination. A series of domestic measures, including eased rules for visas, improved access to airports and expansion of duty-free shopping, have also helped. Visitors from the United States, the fifth-largest market, surged 15.9 percent to hit 1.03 million, marking the first time that American travelers topped the 1 million mark, the JNTO said. The Chinese were by far the largest spenders. Of the nearly ¥3.5 trillion spent by foreign visitors, Chinese people accounted for 40.8 percent, followed by 15 percent for Taiwanese, 8.7 percent for South Koreans and 7.6 percent for people from Hong Kong. The so-called bakugai “explosive” shopping sprees of Chinese tourists are well documented in the statistics. Such consumption reached ¥808 billion in 2015, by far the biggest spending by nationality, trailed by Taiwanese shoppers, who spent a total of ¥218 billion. Going forward, Japan has a lot of room for improvement to become a truly tourism-oriented nation, Japan Tourism Agency Commissioner Akihiko Tamura said.